It’s all about veggies for this pizza. Leftover roasted asparagus, roasted brussel sprouts and fresh grape tomatoes. Feel free to use any veggies in your fridge. The best part is it’s pizza! Preheat oven to 450 degrees. Add a large cast iron skillet to the oven and let it pre-heat along with the oven. If your dough is store-bought, turn it out on a lightly floured surface and let it rest 20 min. While the dough is resting, fry the six pieces of bacon until crispy. Save 2 tbsp. of bacon grease. Drain the bacon on paper towels. Crumble in small pieces and set aside. Use a rolling pin to roll out the dough. Aim for a thin round shape. (Trust me, this is not as easy as it sounds!). Let the dough rest again while you get the skillet from the oven. Remove the skillet from the oven; add the reserved bacon grease and swirl to coat the bottom of the skillet. Fit the dough into the skillet and listen to the sizzle of crust being formed. Sprinkle the dough with red pepper flakes, salt, and generous sprinkle of garlic powder. Sprinkle half of the cheeses, followed by grape tomato halves, veggies and red onion. Sprinkle last bit of cheese, top with goat cheese and bacon. Top with 1-2 grinds of black pepper. Put the skillet in the oven for 12-18 minutes. Check after 10 minutes to see if bottom of the crust is brown. Remove from the oven and let the pizza rest 5 minutes. Slice and serve. I decided to make a veggie pizza after roasting too much asparagus on Sunday and realizing I still had goat cheese from last week’s pizza attempt. You can also roast the grape tomatoes to intensify the flavor. Roasting will add 35-45 min to your prep time if need to roast them before they go on the pizza. Or you can buy the teeny tiny asparagus. That will roast in the time the pizza cooks. Must admit — the ice cold glass of Gosset champagne went very nicely with the pizza. Can’t wait to try next week’s variation! Poker night! 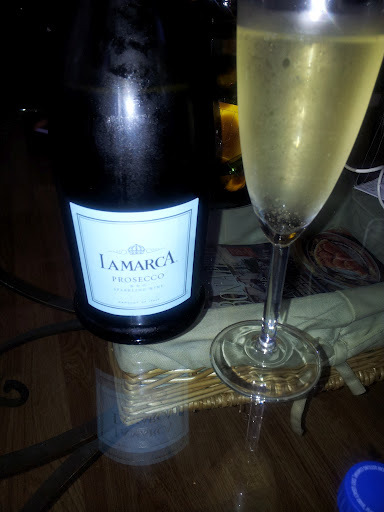 I’m drinking La Marca Prosecco. It’s an inexpensive, easy-to-drink sparkling wine that goes very well with cheese and crackers, light seafood dishes. I enjoy sparkling wine in all forms — Champagne, prosecco, cava, other sparkling wines — and this one is one of my favorites. It doesn’t pretend to have the gravitas of champagne — it’s fun, it’s bubbly, its unpretentious! It’s the friend you call when you want a fun time or when you’re introducing a new ‘friend’ not when you’re announcing the huge promotion or engagement. Great start to poker night — wish me luck! Please share your favorite sparkling wines. I’ll talk more about some of my all-time favorite champagnes in later posts.